Giving children their own space in your waiting room or office area can help minimize restlessness and make for a more pleasant experience for the children, parents, and other waiting clients. Children benches and other furniture are designed with bright colors and inviting fabrics so kids will naturally gravitate to the designated area. 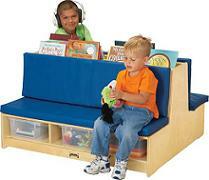 Children benches and kids waiting room furniture is specifically designed with a child's stature in mind. Cozy chairs and pint-size tables can make children feel more at ease, creating a comfortable, relaxed atmosphere and alleviating kids' fears and anxiety about doctors, dentists, or other intimidating people and places. Whether your need chairs for a pediatric waiting room or some inviting furniture for an exam room or counseling office. Contact us today to learn more about our selection on children benches and other waiting room furniture options or to place you order with free shipping today.